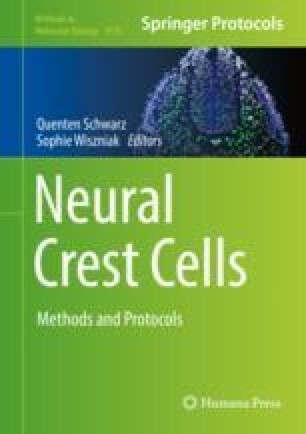 Time-lapse imaging of gut explants from embryonic mice in which neural crest-derived cells express fluorescent proteins allows the behavior of enteric neural crest cells to be observed and analyzed. Explants of embryonic gut are dissected, mounted on filter paper supports so the gut retains its tubular three-dimensional structure, and then placed in coverglass bottom culture dishes in tissue culture medium. A stainless steel ring is placed on top of the filter support to prevent movement. Imaging is performed using a confocal microscope in an environmental chamber. A z series of images through the network of fluorescent cells is collected every 3, 5, or 10 min. At the end of imaging, the z series are projected. This work was supported by the Australian Research Council Discovery Grant DP150103709 to H.M.Y., National Health and Medical Research Council (NHMRC) Training Fellowship APP1071153 to M.M.H., and NHMRC Senior Research Fellowship APP1103297 to H.M.Y.